BOCA RATON, FL (September 10, 2012)— Following the recent spirited Friday Night LIVE! Brazilian Beat festivities hosted by Downtown Boca that drew 10,000 to celebrate Brazil’s Independence Day, Downtown Boca ramps up for its second annual Meet Me On The Promenade free two-night, one-day street-filling community fest set for Friday, October 26th from 6 p.m. to 10 p.m. and Saturday, October 27th from 10 a.m. to 10 p.m. Complete with street-filling live entertainment, great shopping and dining specials, family activities, staged keepsake photo opportunities (including next to the Office Depot Tony Stewart NASCAR shoe car), and more, this year’s event will have a festive Halloween twist with a Downtown Boca Halloween costume contest, shop-to-shop “trick or treating”, Happy Halloween Hours and early family dining specials, and a BEETLEJUICE’S Rock ‘N Roll Monster Revue. Through a fun “Stroll, Shop & Savor” self-tour, event-goers will get plenty of opportunity to explore and enjoy the eclectic live-work-play-stay features of Boca’s new generation Downtown for all generations via event programming designed for discovering all there is to see and do along the Promenade and the areas that it connects such as Palmetto Park Road, N.E. First Avenue, Boca Raton Road, Mizner Park and Royal Palm Place. 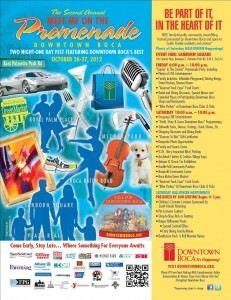 Throughout the fest, there will be an on-going schedule of live entertainment; family-friendly interactive programming and festivities; cultural, wellness and nonprofit showcases; sports and games programming; an artists and crafters expo; a Boca Chamber Village; restaurant food tastings, demos and special Promenade weekend menus; trunk shows; art gallery shows; guided and self-walking tours of Historic Downtown Boca; “chances to win”, staged commemorative photo opportunities and more. Participating shops and restaurants will be extending their hours into the late evening with ‘after parties’ held at Downtown Boca clubs and pubs. Event-goers will find plenty of free parking with complimentary trolley pick up and drop off to these locations during event hours, as well as the Comerica VIB (Very Important Bike) Parking Center at the bank’s Downtown Boca branch (where East Palmetto Park Road meets Federal Highway) from 10 a.m. to 6 p.m. on Saturday. Friday night will feature live “Glee-full” entertainment and live bands, introduction of official Boca Downtowner signature cocktails, and a staged “Fall For Downtown Boca” keepsake photo op for event goers inside a gigantic “walk in” commemorative globe. The evening festivities will kick off with the attendees joining in the official Downtown Boca Bop line dance led by the Fred Astaire Dance Studio in Boca Raton that choreographed and debuted the popular dance at last year’s inaugural Meet Me On The Promenade event. Saturday morning starts early with the American Cancer Society’s 11th Annual Making Strides Against Breast Cancer Walk that begins at the Mizner Park Amphitheater and routes walkers through Downtown Boca along Palmetto Park Road to AIA and back. Meet Me On The Promenade programming throughout the Downtown immediately follows the ACS Walk, with mid-afternoon excitement of a Halloween Happenings! festivities running into the night with after parties at area clubs and pubs. According to City of Boca Raton Downtown Manager Ruby Childers, a “Stroll, Shop & Savor” Downtown Boca self-guided tour program will help attendees navigate easily through Downtown Boca’s community assets: dining, shopping, fashion, culture, family fun, living, and nightlife and all the Meet Me On The Promenade scheduled activities and programming, entertainment, retail and dining discounts, and giveaway offerings. Participating retailers and restaurants will remain open late, and trolleys will run continually during Meet Me On The Promenade activities. 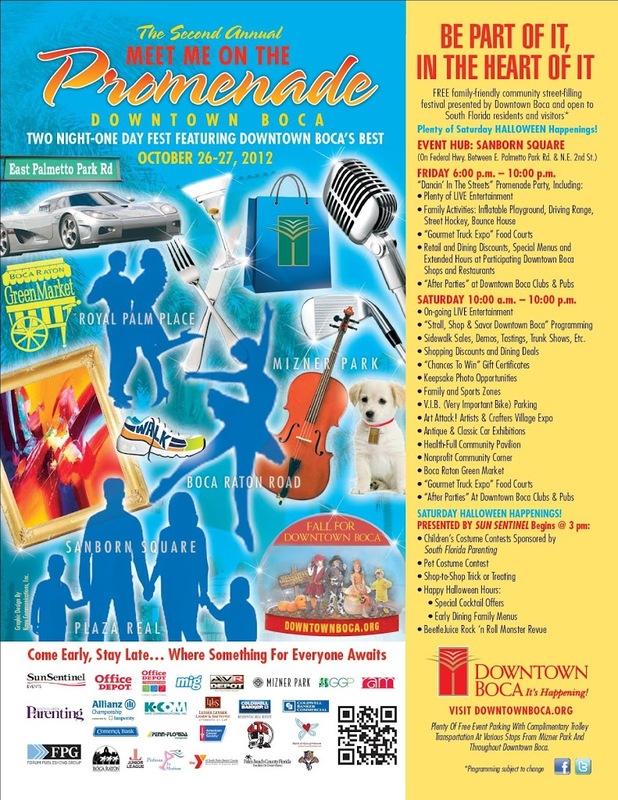 Showcasing the eclectic live-work-play-stay features of Boca’s new generation Downtown for all generations, Meet Me On The Promenade event programming is designed for discovering all there is to see and do along the Promenade. “Meet Me On The Promenade returns as the perfect example of successful public/private partnership engagement as is hosted by the Boca Raton Community Redevelopment Agency (CRA); developed and implemented by the City’s branding and marketing consultants; produced by City staff; supported by the connectivity, participation and collaboration of Downtown Boca businesses and completely underwritten by community stakeholders and partners who understand the important impact a vibrant Downtown community has on lifestyle and economic benefits for an entire community and destination,” said CRA Chair and City Council Member Constance Scott. She added that more than 14,000 event-goers filled the streets of the Promenade during the inaugural event, driving new business to the participating retailers, salons, spas, boutiques, restaurants, galleries and more. Meet Me On The Promenade Sponsors and Partners to date include Office Depot; Office Depot Foundation; Multi Image Group; AVR Depot; Sun-Sentinel; Forum Publishing Group; Mizner Park/General Growth Properties; Allianz Championship; Coldwell Banker; Lesser, Lesser, Landy & Smith, PLLC; Kaye Communications, Inc.; Comerica Bank; RAM, Nestler Poletto Sotheby’s International Realty; Art Attack! ; Potions In Motion; Gourmet Truck Expo; the American Cancer Society; Florida Panthers; Boca Raton Children’s Museum; Florida Atlantic University Charles E. Schmidt College of Medicine; several public and private schools including Olympic Heights High School, Grandview Preparatory School, Saint Andrews School; Spirit of Giving Network; Junior League of Boca Raton; Boca Raton Museum of Art; Boca Raton History Museum; Greater Boca Raton Chamber of Commerce; Palm Beach County Convention & Visitors Bureau; Penn-Florida; Tucci’s Pizza; Royal Palm Place; nonprofit organizations, and media including South Florida Parenting, Boca Raton Forum, West Boca Forum, Coral Springs Forum, Delray Forum, City Link, Boca Piquant, Boca Raton Tribune; The Coastal Star; South Florida Sunrise, LivingFLA.com; and more. To become a programming partner, visit http://goo.gl/KHnCL; register as an exhibitor, visit http://goo.gl/vBlrt, or to become a sponsor, contact Jon A. Kaye at Kaye Communications, Inc., Downtown Boca’s official branding and marketing firm, at jkaye@kcompr.com, 561-392-5166-office, or 561-756-3097.